Kick off your visit on the 10th (Sun): explore the wealth of natural beauty at Noosa National Park. Get ready for a full day of sightseeing on the 11th (Mon): browse the eclectic array of goods at The Original Eumundi Markets, then get a taste of the local shopping with Hastings Street, and then kick back and relax at Noosa Main Beach. For traveler tips, maps, other places to visit, and more tourist information, refer to the Noosa trip planner . Brisbane to Noosa is an approximately 2-hour car ride. You can also take a train; or take a bus. Finish your sightseeing early on the 11th (Mon) so you can drive to Mooloolaba. On the 12th (Tue), get interesting insight from Coastal Cruises Mooloolaba, kick back and relax at Noosa Main Beach, then stop by Peticular, and finally relax and rejuvenate at some of the top local wellness centers. 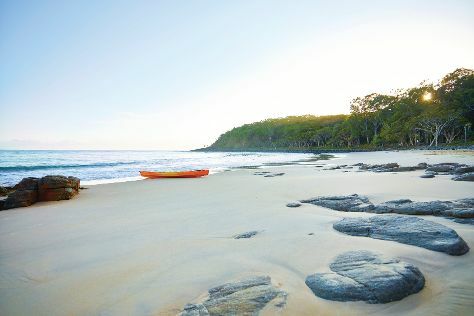 Keep things going the next day: explore the wealth of natural beauty at Noosa National Park. To see other places to visit, where to stay, photos, and more tourist information, refer to the Mooloolaba day trip planning site . Getting from Noosa to Mooloolaba by car takes about an hour. Other options: take a bus; or do a combination of train and bus. In February, plan for daily highs up to 33°C, and evening lows to 24°C. Finish your sightseeing early on the 13th (Wed) to allow enough time to drive back home.